As Founder and Board Member of Green & Tonic, Jeffrey Pandolfino, is an experienced leader with a demonstrated history of working in the Quick Service Restaurant industry. Mr. Pandolfino has a strong background in all aspects of concept development. Mr. Pandolfino’s food service experience spans over two decades and his love of food has been a lifelong passion. Earlier in his career, he was a Catering Manager with Dean & Deluca, a General Manager at Cosi, as well as, an Operations Manager with Pret A Manger. 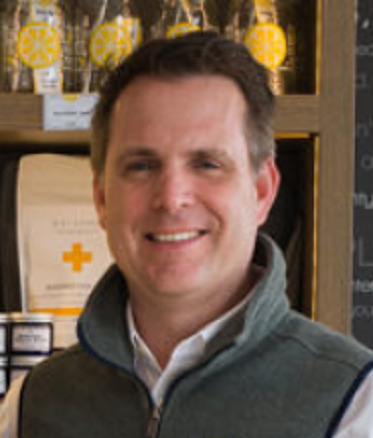 In early 2003, Jeffrey and his then business partner, Cai, and now also wife opened their first company–Plum Pure Foods, an all-natural catering business, café, and cheese shop in Cos Cob, CT. It was at Plum Pure Foods that Jeffrey and Cai realized the impact they could have on community, learned the significance of good service, and appreciated the value of building relationships with locals. This experience propelled Jeffrey and Cai into launching their next food endeavor and in 2012 Green & Tonic was born. This time they dove into the world of vegetarian, vegan, then raw food and juice, exploring the techniques and flavors that made good-for-you foods that were delicious, inviting and accessible. Green & Tonic is a café that offers dine-in or take-out service, catering, as well as, meal plan options with 5 locations throughout Connecticut. Jeffrey received his Bachelor of Science in Restaurant Management from Florida International University, as well as, received his Associate of Occupational Studies in Culinary Arts at Johnson & Wales University.